This, our 27th neighborhood letter, is full of news and happenings for the holiday season. Normally, I (Dennis) write a rambling piece about something that I think is interesting (and hope you do). All along I’ve promised that if I didn’t have anything that was burning to be told, I wouldn’t ask for your attention. With this letter I keep that promise. While I am as excited as ever about this outfit and the amazing people with whom we get to work, I don’t have a story bottled up that needs to be set free. I was thinking that I ought to apologize, but it is more likely that you are glad. As always, we are honored that you choose to be our guests and that you choose to receive these letters. If you don’t want to continue receiving them, please just email us at qwrhinfo@qwrh.com and say that. On the other hand, if you would like to receive more frequent updates, please sign up on any of our Web sites or Facebook pages. Mussels-Wine-Music:Each Wednesday evening (and not just during the holidays), we feature Chef Leigh Hesling’s Mussels(more for less, with our house-cut fries) for $15, five wines from $10 to $15 a bottle and live acoustic music from 7 until 10 PM. The extraordinary talents of Evan Olson & Jessica Mashburn of AM rOdeOplay original music along with some favorites with a local twist. It’s a busy night so reservations are recommended! EMF jazz&blues at Print Works Bistro: Enjoy live jazz music on third Fridays (Nov. 18 & Dec. 16) 9–11:30 PM. We are delighted to partner with the Eastern Music Festival to provide Greensboro with this live music series that you can enjoy while you dine late night and/or enjoy a libation. No cover charge! open 12 Noon until 8 PM. We’ll serve several holiday specials in addition to our full dinner menu. The bar is open until 10 PM. Plus, we will be open for breakfast from 7:30 until 11 AM on these days. For reservations, call 336-379-0699 or visit printworksbistro.com. Skillet Fried Chicken: From 4 PM (until we run out), on Tuesdays in Greensboro and Wednesdays in Cary, we’re making Chef Jay Pierce’s Skillet-Fried Chicken, cooked to order, and served with authentic, traditional sides of collard greens, mashed potatoes, giblet gravy and dipping cornbread. We also feature wine and beer specials, as well as our regular menu. Extraordinary Live Music: On Tuesdays in Greensboro, the skillet fried chicken is accompanied by live music by the very talented Laurelyn Dossett, or some of her friends, or both, 6:30–9:30 PM (no cover charge). Whiskey School: Join us in Greensboro on Monday, December 5, for a four-course dinner paired with six different hand-crafted whiskeys and tasting insight from Heaven Hill Distillery. Go to lucky32.comfor more. Cooking Classes & Beer Dinners: Chef Jay Pierce’s cooking classes in Cary and Beer Dinners in Greensboro have been a big hit. Stay tuned for more in 2012! Holiday Hours: Lucky 32 Southern Kitchen in Cary will serve Thanksgiving dinner from 4–9 PM. Lucky 32 in Greensboro will be closed on Thanksgiving. Both will close at 6 PM on Christmas Eve and will be closed on Christmas Day. Get Lucky & PARTY: If you are invited to one of those shindigs where they ask that you bring a dish, we’ve got you covered! You call, we cook and we bring your order right to your car. Pick up half-pint and pint options of collards, soup, beans & greens, whipped sweet potatoes, creamy grits, pimento cheese, artichoke dip, and don’t forget the black bean cakes. For complete Get Lucky & Go menus, visit lucky32.com. New Year’s Eve & Day Menus: You can get our full, wonderful menu plus some “good luck” food like collard greens, country ham with red-eye gravy, grilled pork loin chops and hoppin’ john on both New Year’s Eve & Day. If you are entertaining friends and family at home, take advantage of our “New Year’s Day-to-Go” with family-style portions of traditional side dishes to bring and pass off as your own! Place your order by 5 PM on Friday, December 30. Go to lucky32.com for more. • We have revamped our Wine Spectator awarded wine list and our beer and cocktail offerings. We even have a selection of artisanal ciders produced in North Carolina and Virginia. • Chef Jay Pierce has been contributing to several publications in the last year, from the “Chef’s Table” editorial in Edible Piedmont, to the “Celebration of Under-Appreciated Southern Vegetables” series in Savor North Carolina, to a feature in Beer Connoisseur about pairing North Carolina craft beers. rotisserie-roasted turkey with all the trimmings, including sides, salads, bread and dessert. To learn more or place your order, call 336-854-2015 or visit greenvalleygrill.com. Nutcracker Tea at O.Henry Hotel: This holiday tradition isn’t just for young folk! Partake on Sunday December 4, 11 or 18 at 2 PM. Treats inspired by dreams of dancing sugar plum fairies, toy soldiers and waltzing flowers will accompany your choice of seasonal tea, warm apple cider or hot chocolate. Talented actors in “character” mingle and each child decorates an ornament plus help our chefs make gingerbread houses. Afterwards, join Clara by the tree as she reads The Nutcracker. Bring your camera! $40 per person for adults and children, plus 20% service charge. Call 336-854-2015 for reservations. Holiday Hours: On both Thanksgiving and Christmas Day, Green Valley Grill is open 12 Noon–8 PM (serving our dinner menu plus traditional favorites), and the bar is open until 10 PM. Chef Leigh Hesling’s Cooking Classes: Here’s a great gift idea! Chef Leigh Hesling will present six cooking classes in 2012, three at Print Works Bistro (March 31, July 14 & October 20) and three at Green Valley Grill (February 11, June 16 & September 15). Tickets are $75 per guest or mix and match a three class package for $200. You’ll get an informative class, a fun experience and a wonderful three-course meal. For tickets, please contact Lee Healy at 336-478-9126 or lhealy@qwrh.com. There’s so much to do in Greensboro during the holiday season, including musical performances, art exhibitions, theatre and shopping. Consider tying in those sorts of activities with a pampering stay at the O.Henry. We offer several packages. Here are some and there are more at ohenryhotel.com. To reserve a package, please call our reservations team at 336-854-2000. Gift of the Magi Package: Check in early at 2 PM to an graciously appointed guestroom and enjoy a $30 amenity voucher, good towards Green Valley Grill, afternoon tea, in-room movies and more. The next morning, enjoy a full, hot, Southern style breakfast buffet and relax in your room with a late check-out of 2 PM. This package is available Friday and Saturday nights December 2–17, or any night on December 18 through January 21 (excluding New Year’s Eve). $199 plus taxes. Ring in the New Year Package: Join us at the O.Henry Hotel to ring in 2012. Start your evening with a bottle of “J” Jordan sparkling wine in your luxurious guestroom. Then take advantage of priority reservations at Green Valley Grill. The next morning, enjoy breakfast in bed and a late check-out of 2 PM, all for $249 plus taxes. Stay an extra night on that Friday or Sunday for only $100 more and receive breakfast in bed both mornings of your stay! Greensboro Symphony Package: This evening of entertainment and relaxation includes a $30 credit towards dinner at Green Valley Grill and two tickets to the Symphony, with transportation both ways. Upon returning to your room, find our handcrafted chocolate truffles and champagne. The next morning, enjoy our full, hot, Southern breakfast buffet and a late check-out, all for $289 plus taxes. (Some blackout dates apply.) The New Year’s Eve performance is “Andrew Lloyd Webber and Friends” with melodies from Broadway. These holiday packages will definitely make you happy. For more ideas, please visit proximityhotel.com. Please call 336-379-8200 for package reservations. Sustainable Cheer Package: Stay on a Friday or Saturday night at Proximity Hotel from November 25 until December 10, or any night from December 15 until January 15 (except New Year’s Eve) and receive a special rate of $199 plus tax, which includes late check-out and a $30 amenity voucher that can be used towards Print Works Bistro and other amenities in the hotel. $199 plus taxes. One-Stop Shop Package: Make use of our proximity to the Friendly Shopping Center. Arrive early and leave your luggage with us. Let us transport you in style in one of our London Taxis to the shopping center, where you can spend the included $50 gift card at any of the 150+ shops. Upon your return, relax in one of our loft king rooms. Use the $30 amenity voucher towards lunch or dinner at Print Works Bistro. Enjoy a 2 PM checkout the following day. $259 plus taxes. Winter Art Show Package: Green Hill Center for North Carolina Art in nearby downtown Greensboro has its big annual Winter Art Show featuring 100 artists from across the state with 500 works of fine art and crafts for viewing and buying from December 4 to January 14 (excluding December 31). Package includes one night’s stay in a loft king room and transportation to and from the gallery. $189 plus taxes. This is one of the best regional professional theatres in America and it is just down the street! Preston and Rich continue to bring to this wonderful community the sort of theater that you’d only expect to find in larger cities. At O.Henry Hotel, our Triad Stage Package includes one night’s gracious accommodations, two tickets to Triad Stage, transportation to and from the theatre, $30 credit towards dinner at one of our restaurants, wine and truffles upon your return, a full, hot, Southern style breakfast buffet, and a late check-out for $269 plus taxes and gratuities. Please call 336-854-2000 for availability. November 25–December 24: If you didn’t see their wonderful adaptation of Dickens’ A Christmas Carol last holiday season, be sure to see it this year! We were blown away with the performances, special effects and the amazing set last year. of North Carolinian Reynolds Price, one of the South’s greatest writers. Watch both parts in one weekend! April 15–May 13: The swinging musical Ain’t Misbehavin’. Oh boy! Go to triadstage.com for show details. Just a reminder that we offer reservations, call-ahead seating and even a pre-ordering service at all three restaurants that expedites service for larger parties. At Lucky’s in Cary, we can handle up to 70 people in a semi-private dining area. In Greensboro, the private dining room seats 10, and we can host larger parties in the dining room. To enjoy the extraordinary food from Green Valley Grill or Print Works Bistro in the beautiful private event spaces of the hotels, please contact the events team at 336-544-9615 (O.Henry) or 336-478-9111 (Proximity). We can host an intimate gathering of 15 or a bash for 150. Great news! We can customize a gift certificate with you for a hotel night stay (or even a variety of packages) for your fortunate recipient. Just call the Proximity at 1-800-379-8200 or O.Henry 1-800-965-8259. If you call on “Black Friday” (November 25) between 8 AM–10 PM, we’ll throw in a complimentary $25 restaurant certificate with each overnight gift certificate. All of our businesses offer gift certificates for purchase seven days a week. Or you can order online at qwrh.com. 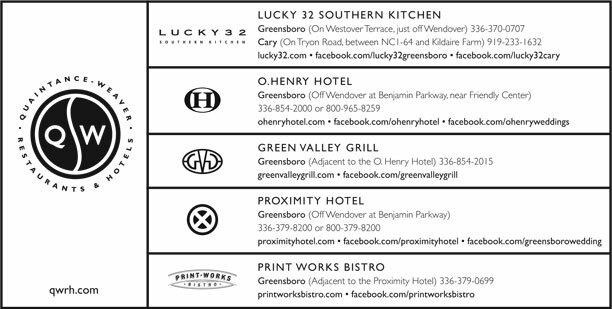 Visit printworksbistro.com, greenvalleygrill.com and lucky32.com for the current seasonal menus, the latest wine list and online reservations via OpenTable.com (featuring a nifty rewards program). With larger parties we offer pre-ordering to expedite service so you have more time to enjoy your visit.